Subject: Ender's Comprehensive Pictorial Overview: Because any fantasy adventure game that features Aldie and Derk as game characters has to be good! In a previous review of a somewhat obscure game, we proved the truth of the old adage that good things come in small packages. In this review we hope to disprove a different adage: the one that claims that lightning never strikes twice! And that’s because with the Adventure of D we once again find ourselves confronted with a rather small, unassuming box. In addition, the contents of this particular box prove to be something of a home-brewed effort, so this game finds itself a little bit off the beaten track in terms of contemporary game design and production. Be that as it may, there’s one more proverb that springs to mind, and that's the one about finding diamonds in the rough! Now we wouldn't put time and effort into posting a review for a game that we didn't think was worth your while, so that already tips our hat just a little doesn't it? 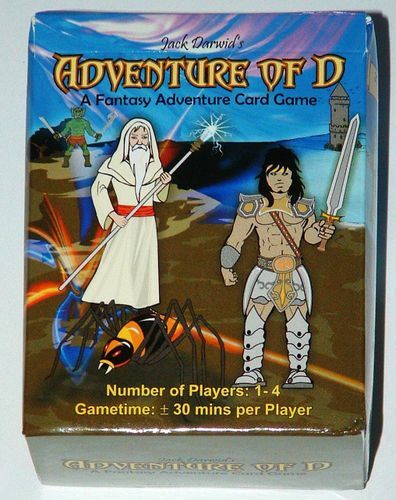 So that’s why today we’re taking a look at Adventure of D, a fantasy card game for one to four players designed and published by Mr. Jack Darwid. Some of you may already be familiar with Mr. Darwid’s earlier print-and-play games, most of which are set in what has become known as `The D-Universe’. 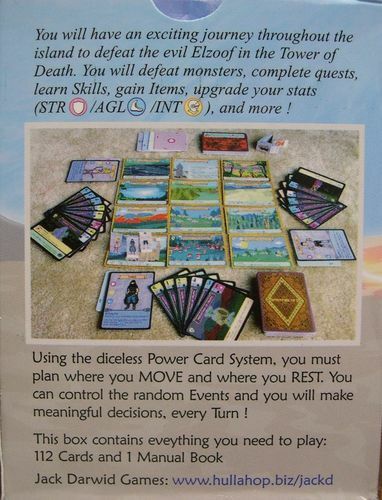 All of these games (including Adventure of D) are dice-less games that are based on what he has called the Power Card system. 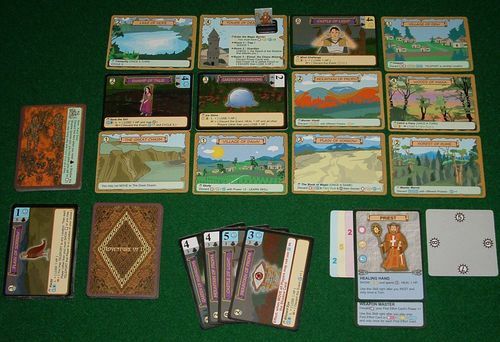 In the Power Card system, all of the game’s characters, locations, actions and random events are represented and/or generated by cards that are drawn from a common deck. 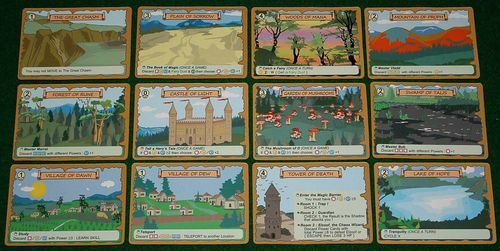 In other words, cards have multiple abilities and are used in various ways, much like what we’ve seen in other games like Glory to Rome, but in this case applied to the fantasy adventure genre, and with many unique elements. So, will Adventure of D prove to be a diamond in the rough? Will lightning strike twice when it comes to good things coming in small packages? We had high hopes, given some early indications that seemed very promising. To begin with, a quick check of Mr. Darwid’s BGG account reveals that his avatar is the intrepid adventurer from the classic Hero’s Quest computer games that were designed back in the day by Sierra Games. There’s every reason to believe that a gentleman with such discerning taste in computer games closely linked to our own personal nostalgia would be capable of designing a card game that proves both satisfying and fun! What’s more, the game works particularly well as a solitaire game, which will make it appealing to many gamers. Furthermore, it features Aldie and Derk on some of the cards – if that isn’t going to sell you the game, nothing will! Well, read on to find out if Adventure of D is for you! 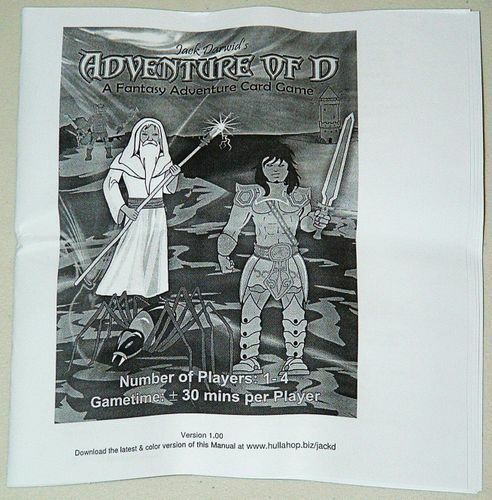 Aldie and Derk - alive and in an Adventure of D game box near you! We’ve already commented on the relatively small size of the box and that’s something which creates a few issues. There’s good stuff inside this little box, but the trouble is that the good stuff isn’t all that easy to put back inside the box once you’ve let it see the light of day. Repacking the game really is something of a puzzle in and of itself, but with the correct application of force and guile, you can usually manage to repack the game in a functional way. The card quality isn’t outstanding, not surprising given that it’s somewhat of a home-brewed game, but all things considered it’s not bad either. There is a certain tactile quality to the cards that is really rather satisfying – which is something of surprise for a self-published game. These cards just feel good in your hands, and are reasonably durable as well. So let's get to an overview of the different kind of cards in the game and how they function. 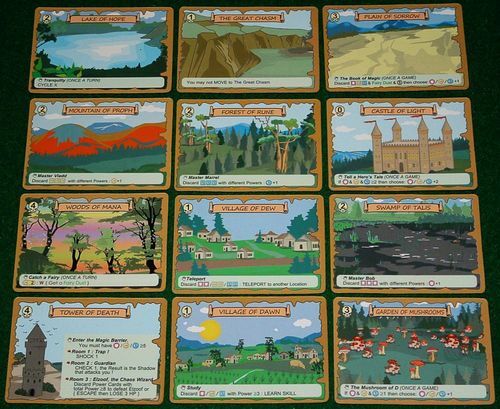 These are the 12 cards that you are going to use to form the game ‘board’ as it were. The location cards will be shuffled together and laid out in a 3x4 grid and the heroes will move around on this grid as they travel from location to location. 1. In the top centre of the card you’ll find the name of the location. 2. In top left hand corner of the card you’ll find a number which indicates the danger level of a particular location. This danger number will play a key role in determining whether or not you will be attacked by shadow creatures as you travel the island. 3. Along the bottom of the card is a section which informs you about the specific action(s) which can be carried out at that location. As the game progresses you will also be placing event cards on these locations – events that need to be dealt with before you can take advantage of the actions that a particular location offers. 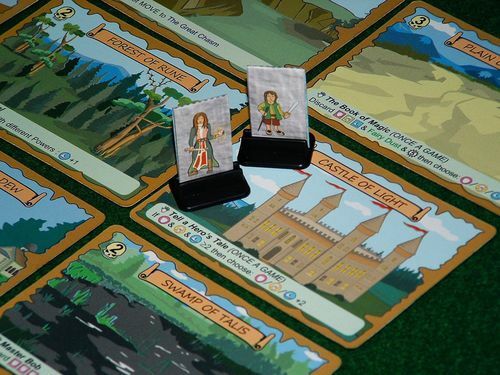 The Hero cards represent the characters that you will be marching around this ensorcelled isle during the game. There's 20 different types, many of them the stereotypical characters that inhabit your ordinary fantasy adventure game, like a Wizard, Dwarf, Hobbit, Druid, Ranger, and Elf. But there's a few less usual ones as well, like Gladiator, Miner, and Ninja. 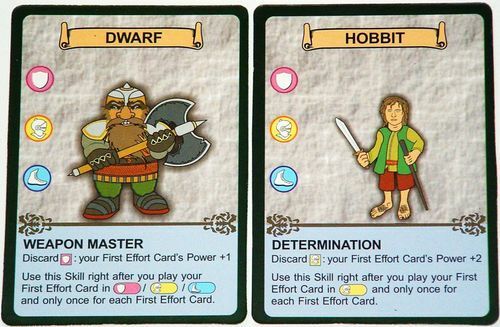 In addition to serving as unique character cards, each with a special ability, these cards also serve as skill cards that are used to track the skills that your character might gain as the game progresses. In terms of the information provided on the hero cards there are several details that need to be noted. To begin with, the top centre of the card reveals the hero’s name/class. Next, you will notice that there are three symbols running down the left-hand side of the card. • At the top you’ll find a shield icon – this represents your character’s strength. • Below that is a helmet symbol which represents your character’s intelligence. • Finally, the foot icon at the bottom is an indicator of your hero’s agility. At the bottom of the card you will find the unique ability that your character begins the game with. As the game progresses it’s possible to increase your character’s stats – including their intelligence. The benefit of increased intelligence is the ability to acquire more skills. For each skill point your character earns they are able to learn one new skill. 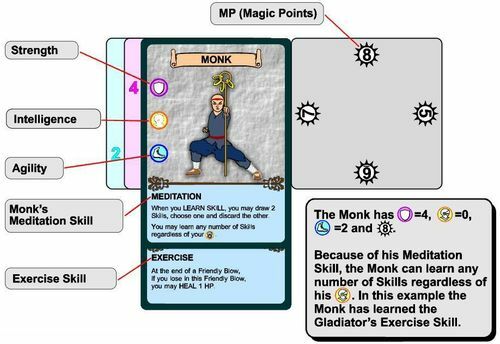 If you learn a skill during your travels, you simply shuffle the hero cards and randomly draw one and whatever skill is indicated at the bottom of the card, you now possess. Simply slide the newly acquired hero/skill card underneath your character card until only the skill box is visible and voila! One final note about the hero cards. They can, in certain circumstances serve as an item – specifically Fairy Dust – that you can acquire during your adventures. 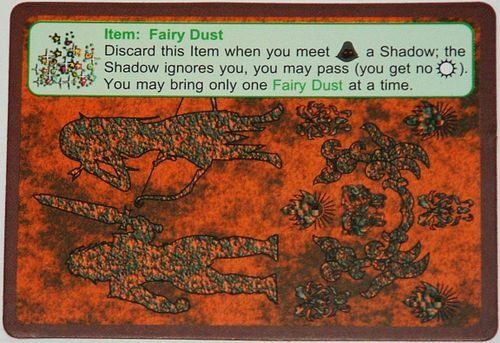 Fairy Dust can be used to help you evade unpleasant encounters with shadow creatures – but more on that later. 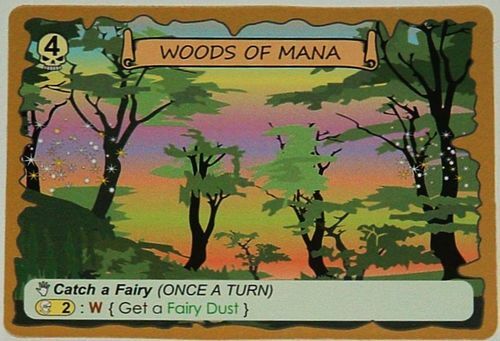 Should you acquire said Fairy Dust, simply take a random hero card from the remaining stock and use the reverse side of the card to indicate your possession of the Fairy Dust. As noted above, over the course of the game you can increase your skill levels. In order to keep track of your growing skill levels, a number of upgrade cards have been included with the game. 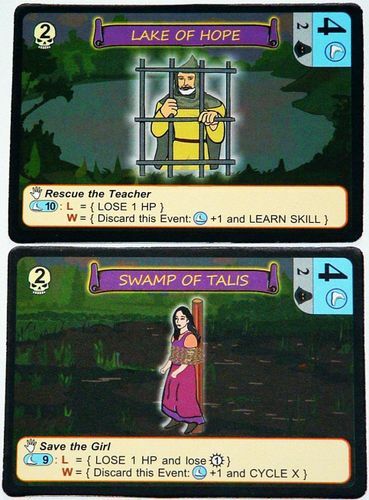 These cards can be stacked on top of one another in the order of skills listed on the hero card and subsequently slid beneath the left-hand side of your hero card. You simply need to rotate the cards every time you gain a skill point. If you run out of points on the one side, flip the card over and keep on going to the maximum value of 8! It's a clever and simple mechanism to `dial' up your stats! 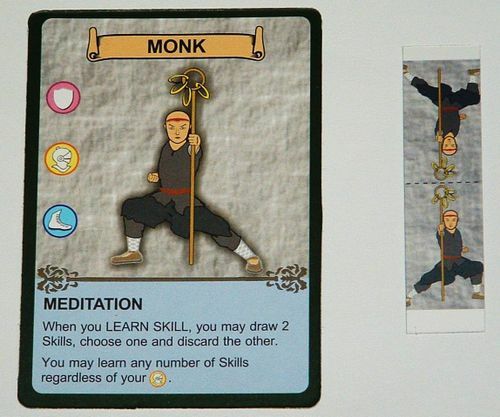 In addition to the skill up grade cards, there is also a fourth kind of card of the same size. This card shows numbers situated inside a sunburst symbol. These cards can be placed on the right-hand side of your hero card and they are used to keep track of any magic points that you might gain. 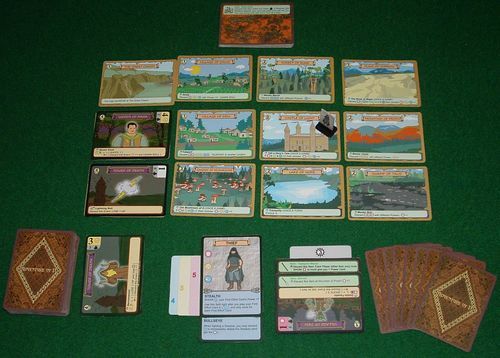 The game also contains four sheets of hero token cards. 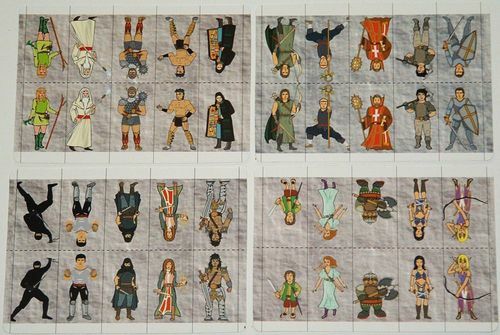 These sheets can be cut out to form fold-over character tokens that you can place on the game board to indicate your character’s current location. 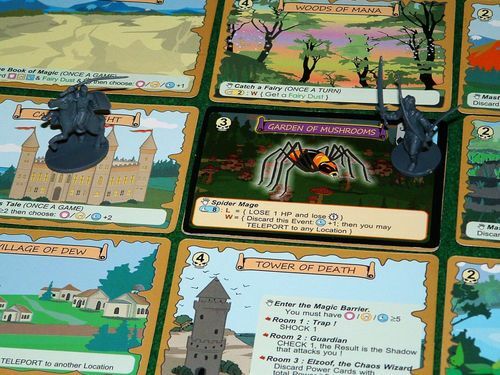 These tokens are not an outstanding solution to this particular problem – however, you could substitute any kind of counter/token that you possess in their stead, or borrow some plastic stands from another game, or even some miniatures from your favourite board game, as seen in some of the pictures in this review. This brings us to the largest and most significant group of cards – the 60 power cards. These cards really represent the engine of the game and they can serve a number of different functions in the course of the game. • To begin with the cards in your hand represent your hit points. The maximum number of hit points that you can have is eight, and as such eight is the maximum number of cards you can have in your hand. Any cards in excess of eight need to be discarded. 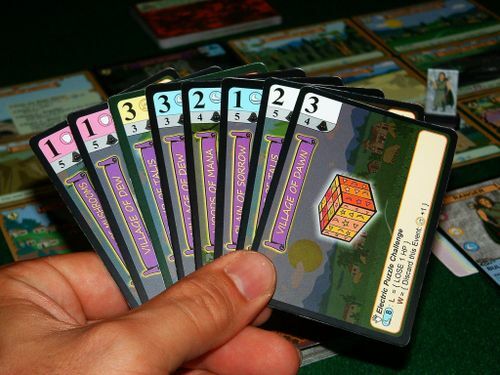 • In the upper left-hand corner of each power card you will find a number which indicates the power level of that card. The power level of these cards ranges from one to five. 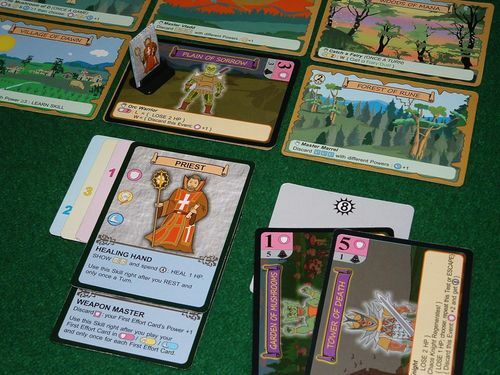 Beside the number indicating its power level, the power cards will also exhibit a shield (pink), helmet (yellow), or foot (blue) symbol which correlate to the stat symbols on the character card and indicate what type of card it is. Cards which have no symbol (white) do not have a type. • Directly below this number, there is an additional number located next to a very Darth Vader like icon. This number indicates the strength of the various shadow minions you’ll face in your travels. This number also indicates how many magic points you will gain if you defeat your shadowy foes. 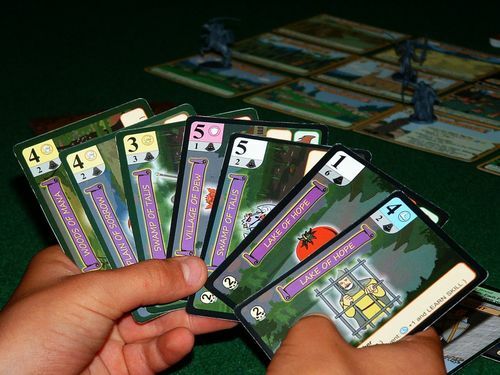 • The power cards also serve the function of providing a supply of events that will take occur at specific locations over the course of the game. Along the side of each power card (it's the top center when you orient the cards correctly to serve as events) a location is written that corresponds to one of the location cards that make up the game board. When an event is played, it is placed on the location card that it corresponds to, and must be dealt with before the action on the location card can be activated. Some events are monsters that you have to fight, like the Spider Mage or Giant Stinger, while others are fun Challenges like Rescue the Teacher and Save the Girl. There's even an Arm Wrestling challenge, and a Carnivorous Plant! The chief benefit of events is that when completed successfully, they help you improve your stats, and thus prepare you to take on Elzoof. 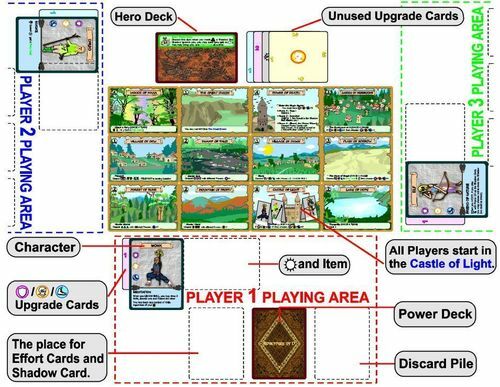 • Finally, the power cards also serve as the various items that you can collect. When some of the events are dealt with they provide the opportunity to gain an item, like scrolls or potions, many of which can be discarded for a special one-time effect. That specific item that you gain is listed below the event and you can keep track of the items you collect by placing them below the card that tracks your magic points. Remember how we commented that re-packing the game back into the box was an adventure in and of itself? Well a significant part of that adventure is finding a way to fold the rule book around the various components in a fashion that allows you to slip it back into the box. In addition to being a little bit cumbersome in terms of construction, the prose and layout of the rule are also a little bit clunky. In your first game or two you are frequently going to be referring back to the rules, and navigating through the 16 page black and white pamphlet isn’t always the easiest task. Fortunately can also download a full colour rulebook from the game’s designer here – an electronic copy of this also helps ease the learning curve. The game isn’t that difficult, but some of the concepts are quite original and unique, and this is one of those games that is in the category of being easiest to learn if you are taught firsthand by someone who already knows the game. Having said that, everything that you need to know is in the rules and a little persistence pays off – and once you’ve got a couple of games under your belt the whole system flows along quite smoothly. The back page of the rulebook also has some handy references that function as a helpful roadmap for the first few times playing the game. Now, a word or two needs to said about the artwork and naming of the cards. We used the word kitschy to describe the box art, and that’s pretty much the case for the cards as well. Take a look for instance at the Garden of Mushrooms card that has the Mad Goblin on it. What is that goblin on?! Or better yet, check out the Plain of Sorrow card that has the Jelly Cube on it. We’ve played a lot of fantasy games in our time, but never, never have we been attacked (nay, even hindered on our way) by a gelatinous cube! Here’s the thing though – the artwork is certainly unique, but it fits with the light-hearted character of the game – and, as we noted above, it kind of grows on you as well. There is, after all, something surprisingly satisfying about the opportunity to do combat with a Jelly Cube! And what about the Electric Puzzle Challenge? Now that you think about it, doesn't the prospect of facing an evil creation by genius Mr Rubik sound just a little scary, and outlandish fun?! 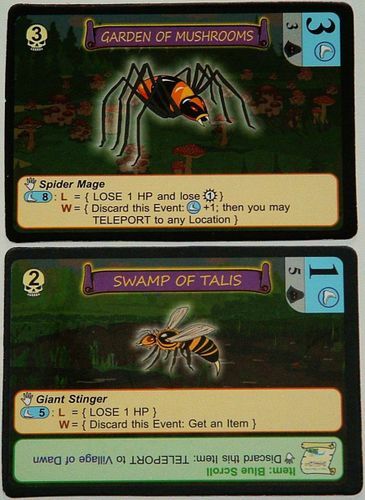 As you travel through the universe of the game, you will also notice that many of the cards have been named and/or illustrated as a homage to various other well known games, designers, and even board game website admins! 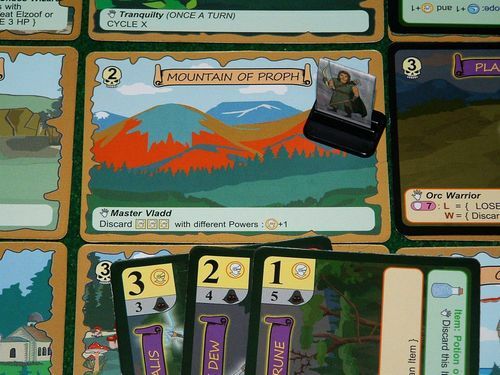 There's Master Bob (Swamp of Talis), which is a nod to designer Robert Harris and his game Talisman; Master Marrel (Forest of Rune), which is a nod to designers Martin Wallace & Darrell Hardy and their game Runebound (First Edition); and Master Vladd (Mountain of Proph), which is a nod to designer Vlaada Chvátil and his game Prophecy. Then of course there are the distinctly recognizable faces on two cards that we've already shown you. One unmistakably features Derk (the Master Derk card). 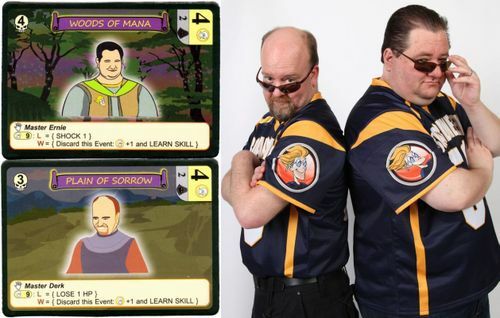 The other features Aldie, as well as the BGG mascot Ernie (the Master Ernie card) - if you look closely at the artwork on the card you'll see Ernie pictured on Aldie's clothing. Bravo Jack Darwid for incorporating this humorous element in the game! What a wonderful tribute to the two gentlemen that we're all indebted to for creating and running this site! All this injects a sense of humour and levity that is much appreciated and just adds to the overall flavour of the game. So, now that you’ve had a look at the components you get, you might be asking yourself: “Well and good, but what’s my job in AoD?” Well, it’s pretty straightforward stuff really. You see there’s this island; an island that’s been placed under a curse by a wicked wizard named Elzoof. And the nature of Elzoof’s curse is that it prevents anyone from being able to leave the island. So, if you try to escape the island by fleeing from its western shores, you’ll find yourself magically transported to its eastern shores – and the same thing will happen if you attempt to leave from any other direction. Your task as hero, then, is to free the island and its inhabitants from Elzoof’s oppressive hand. Shouldn’t be too hard...right? All you have to do is fend off his hordes of Shadow minions, track him down in the Tower of Death and then defeat him in combat. Nothing that isn’t all in a day’s work for a hardy and experienced hero like yourself! Just be sure to build up some strength, intelligence, and agility before that final show-down! To begin your adventure you’ll need to set up the island landscape. You do this by taking the twelve location cards, shuffling them together, and laying out in a three-by-four grid in front of you. Next, shuffle the deck of hero cards together and deal out one random card to each player. Having done so, each player now performs a check to determine the starting skill for their player. This check is performed by turning over the top card of the power deck and examining the ‘type’ of power card that’s revealed. If you get a shield, helmet, or foot symbol, then your character begins the game with one skill point of that particular skill. If you reveal a white (no-type) power cards, than you get to choose the category of skill with which your character begins the game. 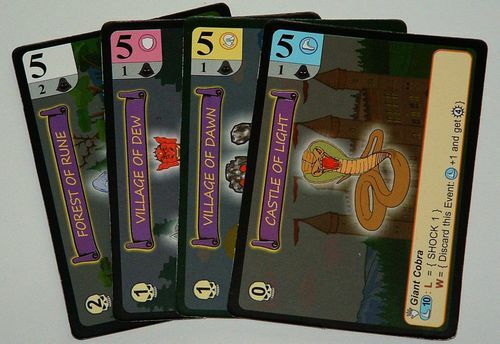 Then place each player’s character token (either the token that came with the game, or whatever kind of token you might choose to employ) on the Castle of Light card. Having done this, shuffle together all of the power cards and then randomly determine a start player. Then, moving counter-clockwise from the start player, deal out eight cards to the last player. Each player after the last player should receive one less cards then the last players (i.e. 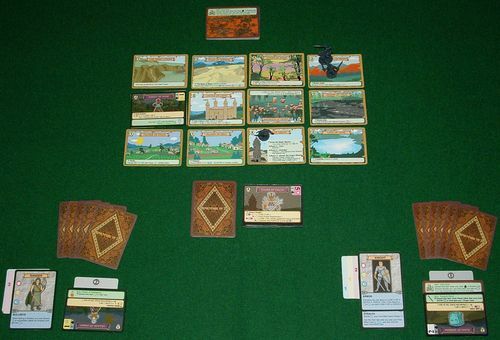 in a four player game, the fourth player would receive eight cards, the third player seven, the second player six and the starting player five cards). Then shuffle the deck of power cards (including the discard pile) and give that deck to the starting player. You are now ready to battle the forces of evil! 1. Reveal a New Event (x2). 2. Move / Carry Out An Action. Now for a brief overview of these various phases. • If there is already an event card on that location the previous card is discarded into the discard pile. • If there is another event card anywhere on the board that shares a type (colour) with the newly drawn event card, discard the old event card and place the newly drawn card. • Continue this process until an event card is successfully placed on a location. In a solitaire game, you make the decisions about keeping the events yourself. It is important to note that above process is to be carried out twice during this phase, so each turn should see two new events. The first thing that needs to be noted about this phase is that you may carry out any number of movement and/or actions (in any order) that you choose – until the point that you choose to rest or that your hit points equal zero. 1. Select a power card from your hand to use as a shadow card. This card will represent the shadow minion that you will potentially meet along the way. 2. Move your hero token to an adjacent location on the board. Now, remember that curse which Elzoof put on the island – here’s where it makes the transition from theme to rules. If you move off the edge of the map, you’ll reappear on the other side of the map. 3. Having moved, you must now perform a shadow check. How do you do that? Well, you draw the top card of the power deck and look at the power value of the card. If the power value of the card is greater than the danger level of the location that you have moved to, then you are safe and you do not encounter a shadow minion. Move the power card you played for its shadow value to the discard pile. If, however, the power value of the card is less than or equal to the danger value of the location you moved to then you do meet the shadow minion and must do battle with it. To defeat the minion, you must discard cards equal to, or greater than, the strength of the minion. Ouch! Having done so, place the shadow card to the discard pile and gain magic points equal to the power of the minion you defeated. If, however, you are unable to defeat the shadow card you must discard the remainder of your hand, and place the shadow card in the discard pile. 4. If the new location has an automatic event you must carry out that action immediately. It’s also possible that, in the process of moving, that you might land on a space occupied by another player. If this turns out to be the case, and if you have not encountered a shadow minion, then you will need to carry out what’s called a ‘friendly blow’ - this involves both players choosing and comparing a power card from their hand to boost the character stat chosen by the defender, and the player with the highest total draws one card as the spoils of victory. When it comes to movement it is also possible that on occasion you might find yourself teleporting to given locations. If teleportation is the means of your conveyance, than no shadow minions are encountered and no friendly blows are carried out. You can check out the rules for more details about the process of teleportation. This leaves us with the matter of actions. As noted above, some locations have automatic actions which must be carried out when a character moves onto a location. There are also non-automatic actions (indicated by a hand symbol without lines of movement) which you may elect to carry out. Some of these actions may only be performed once during the game, while others may be performed multiple times. Most of the actions require you to carry out a test before you can successfully carry out the action. These tests are keyed to specific kinds of skills and must be dealt with as such. 1. 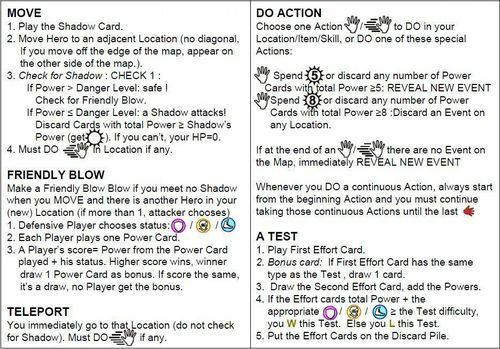 Select a power card from your hand and put into play as your first ‘effort’ card. 2. If your first effort card matches the type of challenge indicated by the test (e.g. it is an agility test, and you select and play a power card with the agility symbol as your first effort card) you may proceed to draw one card from the power deck and add it to your hand. 3. You then draw one card from the power deck and place it with your first effort card and combine the two power values together. 4. If your combined total is greater than or equal to the test value than you succeed in passing the test. 5. All of your effort cards are placed in the discard pile. One key element to remember in the carrying out of actions is that you must always deal with any event cards in a given location prior to being allowed to carry out the action indicated on the actual location card. This is the final phase of your turn. 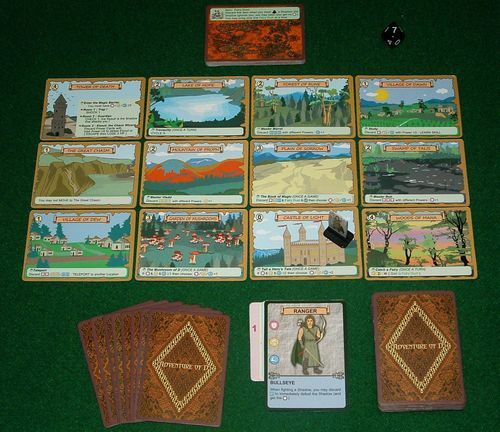 When you rest, you may discard any number of power cards from your hand that you wish (although you must retain at least one card in your hand) – and then you may draw cards from the power deck until you have a hand of cards equal to the danger level of the location in which you conclude your turn. Resting is an important way to restore your energy, because if at any point during your turn, you have no cards in hand – that is to say, your hit points equal zero - this represents your health reaching a critical low, and any movement or actions you are busy with stop immediately, and you cannot move, carry out actions or tests, or use items, and further you must skip your next rest phase that turn, and rest as normal on your next turn. You’ll have to be careful and make sure this doesn’t happen, because if you let your health get this low, the harsh penalty will usually cost you any chances of winning! So how do you win the game? 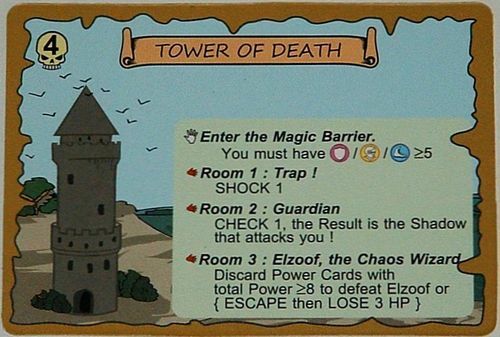 Well, when you feel that you are strong enough and have acquired enough abilities (you must have at least 5 in one of the three skills), you journey to the Tower of Death and confront Elzoof himself. If you defeat him, by meeting the pre-requisite abilities and make it through the series of challenges alive, then you win the game! There are are some optional scoring rules that assign Legend Points – but you can check the rules for that! 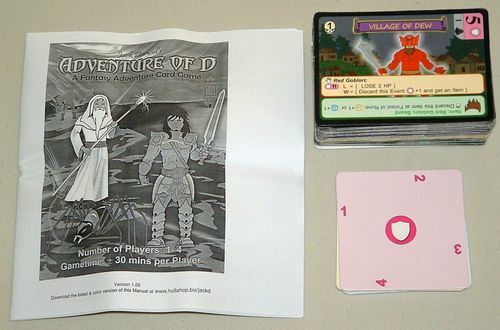 There are also some modifications to the rules that allow you to play Adventure of D as a solo game. In short, you ignore any effects on cards that refer to other players, and you decide yourself whether to accept or reject new events. Most importantly, you need to establish a game clock – and this is done by setting aside a number of hero cards (four for a hard game; five for a normal game, six for an easy game) at the start of the game. Each time you go to rest, you must first place one of these cards on the bottom of the hero deck. When you run out of cards to remove from the game – and if Elzoof has not been defeated – then you lose the game. This effectively makes the solitaire game a race against the clock – can you build up your character abilities quickly enough in order to defeat Elzoof before the end of the game is triggered? Puzzle: It's the last turn, so what chance does this Thief have of winning this game? Charming artwork. For a homegrown job that originates from someone's kitchen table, the artwork is really quite impressive! No, it's not Fantasy Flight Games quality cards and graphic design, but considering how few people were involved in this project, the outcome is quite remarkable. If a criticism is going to be made about the components, it's about the cards - they're literally somewhat rough around the edges and not always cleanly cut with straight lines - although this doesn't become a gameplay issue and is only really noticeable when you magnify it. But sometimes game publishers make the mistake of having fantasy artwork that's too dark in nature - that's not the case here, and there's a sort of pleasant charm that makes it entirely appropriate for children, and to be honest, even for adults. Perhaps it's partly as a result of the gameplay, but the artwork grows on you! The Power Card system. Ok, so the production quality of this game might not match that of your most recently purchased FFG title. But here’s the thing – this game actually works well despite its humble exterior. This is really a reflection of just how well designed the power card system actually is. 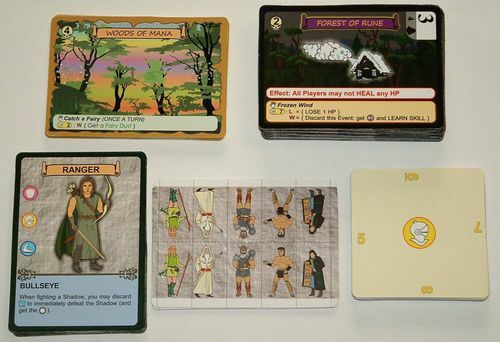 Mr. Darwid has taken his cue from the world of card-driven war gaming, but has found a way to simplify these more complex systems into a lighter, more accessible format that still succeeds in providing a sense of meaningful game play and decision making. It really is quite straightforward once you get the hang of it, and the designer deserves some real credit from coming up with this clever little system where cards have multiple uses in a way that's different from most other games. It ensures that the game has random elements - which every fantasy adventure game needs - yet there's no dice-rolling! Solitaire-friendly. This is a game which probably works best with either one or two players. To be sure, you can play with up to four people, but the downtime between turns can become a little bit of an issue as you add more players. It should also be noted that this is game in which the level of player interaction is relatively low. Mr. Darwid has indicated elsewhere that he deliberately designed the game to minimize player-vs.-player conflict and in this he certainly has succeeded. There a level of interaction is present in the form of having to choose or reject the random events that are drawn, as well as via the friendly blow encounters, but a two player game it is primarily a race to see who can build up their character the quickest in order to take on Elzoof. While this works fine, it does mean that Adventure of D makes for an excellent choice as a solitaire fantasy adventure game. 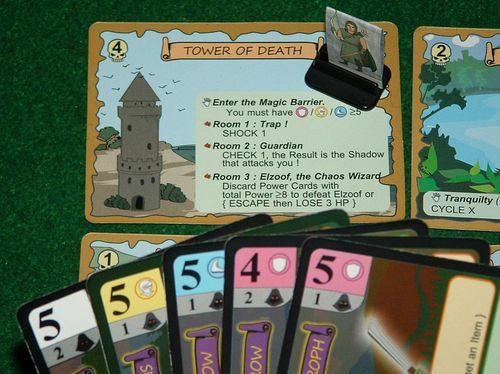 The solo game plays out quite enjoyably and in a reasonable amount of time (about 30 minutes), and has the adjustment of setting a time limit for your defeat of Elzoof. Puzzle-like. Adventure of D does feels a bit like a puzzle after a while, and with experience you start to get to know what strategy to use. The game will be different every time because of the different events that are drawn, leading to different possible challenges available at any given time. But usually you want to build up your skills, especially using the Masters, then the Garden of Mushrooms and the Castle of Light. The randomness of the card draw keeps the game interesting and prevents it from being truly solvable, but you certainly can develop certain strategies that will give the best chance of success. But there's still always the element of risk - which challenges should you take on, and should you opt for the road of caution or the road of danger? But of the few comments that have been posted, the vast majority are positive. More than one person - Tom Vasel included - have suggested that it's clever enough to deserve being picked up by a bigger publisher, and thus get an audience in the wider gaming market! So is Adventure of D the game for you? 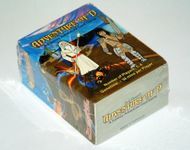 Especially if you are looking for a lighter and fun fantasy adventure game that plays well solitaire or with just two players, and is both quick to play and eminently portable (although you will need a reasonable amount of table space to play), then this might just be the game for you. 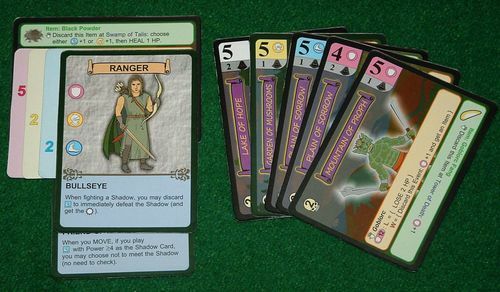 Whether you play against another opponent, or against the game-clock in the solo game, Adventure of D provides the sense of having to race against time to buff up your stats and take down the evil wizard. All in all, this is a clever little game that deserves more attention than it has received until now, and considering the unassuming package, has proved to be a pleasant surprise. Mr. Darwid is to be congratulated for having brought this labour of love into production and on to our gaming tables! Let the adventures begin! Credits: This review is a collaborative effort between EndersGame and jtemple. Subscribe to this list to be notified when new reviews are posted. This is indeed a hidden gem. Not that I wouldn't encourage anyone to go get this but I'm anxious to the see the next iteration of this game system (assuming Jack Darwid has more planned for the D-Universe). Thanks for another great review Ender! Great design. User friendly. Simple. Great starter game for someone new to gaming. No, its not Fantasy Flight Games or Flying Frog Productions, but its in the World of D. What more could you want from a 30 minute game. Enjoy and have fun. Good gaming to all.